I am sharing this article from my other blog – Knowliz, which provides you a resource of over 50 places to share photos, videos, music, documents and any other file. Check it out. Alright guys, here is the complete research result of my hard work over the previous week or so. I am providing the results in a series of 4 posts. (Believe me, it is a lot of work to compile the result and provide them in a easy to follow format.) This post is second in the series. The first one was the consolidation if people find it easy to follow the excel file and all. Below is a list of 30 places to share Photos, Video, Music, Documents and other files and hosting solution. Rest 30 or so will follow in a future post. Hope you find it useful. I have been playing around with couple of blog platforms for some days, Blogger, WordPress, Livejournal & Vox etc. Because of the complication of using WordPress.org, domain & webhosting and all and overall cost involved, I made up my mind. Finally I have booked a domain for myself : www.knowliz.com. I will be moving all my blogs to this address and kind of reduce some burden of maintaining different blogs containing almost same content i.e. Technology related whether it is Ubuntu, linux, Computers, Microsoft, Office, Vista, Web 2.0, Open Source, Blogging or anything related to computer and electronics. I was not completely free to use and modify my blog the way I wanted, but I could do that with Blogger. I was not able to use ads or anything containing iframes and scripts…really felt bad about it. It limits lot of possibilities for me. I can’t modify the default templates available to further customize it for my purpose. It was kind of forcing everyone to switch to wordpress.org if they wanted any customization and wanted to tweek a little bit here and there…. In my personal opinion, if wordpress.com is free then let it be free like blogger, please don’t limit the possibilities. I was not able to write the paid reviews which might have helped me to host my blog going forward. I added one recommendation on this blog to use Ubuntu and some non-profit links in the sidebar, they were removed. Sorry about it….I hate wordpress.com about this. But that is my personal opinion and kind of constrain right now not to invest too much on web hosting and domain, so I am merging this blog with my own domain on www.knowliz.com. See you all guys there on that page. Knowliz.com will have everything you got on this blog related to Ubuntu and open source community as well as other technology updates. I am sure you will really like it there. So, don’t wait any longer, click on any of the links provided in this post and subscribe to the feed. Thank you wordpress.com, but this is not the place I thought will be the best place to set up my blog on. Edit: I just noticed that the Ubuntu recommendation links are back. Thanks for that. How to install Google Earth on Ubuntu/Linux? I am sure Google Earth will be among the first few things you will want to install on your Ubuntu machine. The installer which you get online is not a regular installer which Ubuntu default installation will be happy with. You can’t just double-click to install it. 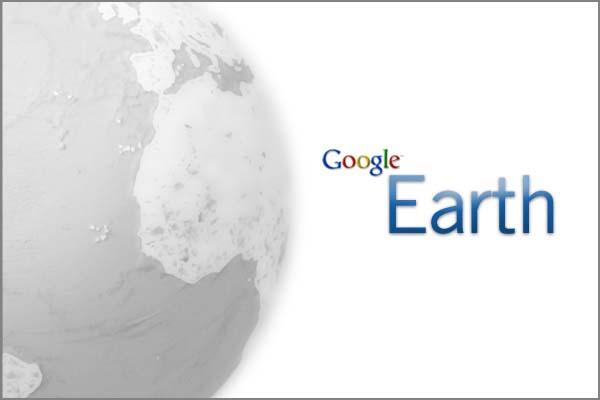 Download Google Earth to your desktop. Go to Applications > Accessories > Terminal. Follow the on screen prompts to complete the installation. You will see Google Earth icon on your desktop after the installation is complete. At the same time it will also give you an option to launch it for the first time after the installation is complete. Google Earth should have been installed in the default location “/usr/local/Google/Google-earth“. That’s it. Enjoy the cool Google Earth features. TIP: By the way, you might have already guessed the trick. To install any software on Ubuntu with a *.bin extension you can do the same to install it. Just browse to the directory, at the terminal type sh *.bin. Your software should be installed properly. Keep reading Technomania for more tips and tricks on Ubuntu, Linux and Open source community updates. You can subscribe to the feed or receive email as and when I update anything on this blog. I am sure you have always used to think if it is possible to have different wallpapers on different workspaces in Ubuntu using GNOME. Isn’t it? Don’t worry I have a tip for you, and it is very simple too. You have installed CCSM. Check under System ->Preferences if Advanced Desktop Effect Setting is there. 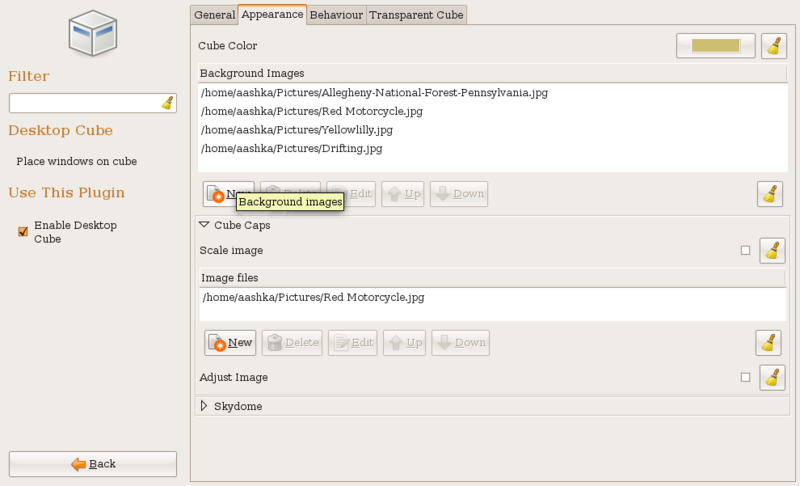 Click New under background images and add all the images you want as background. Alt + F2 to launch the Run Terminal. Enter gconf-editor and hit Run. You will notice that you can’t right-click on the desktop and all your existing desktop shortcuts are gone. But don’t worry they are not gone. You will have to go under Places > Desktop to see all the thing you kept on original desktop. Going forward if you save something on desktop they will also appear on that location only. This is one thing you will have to sacrifice if you want to have different wallpapers on each workspace. But hold on…there is a good news for you if you enabled Avant Window Navigator, then all your shortcuts should be there. 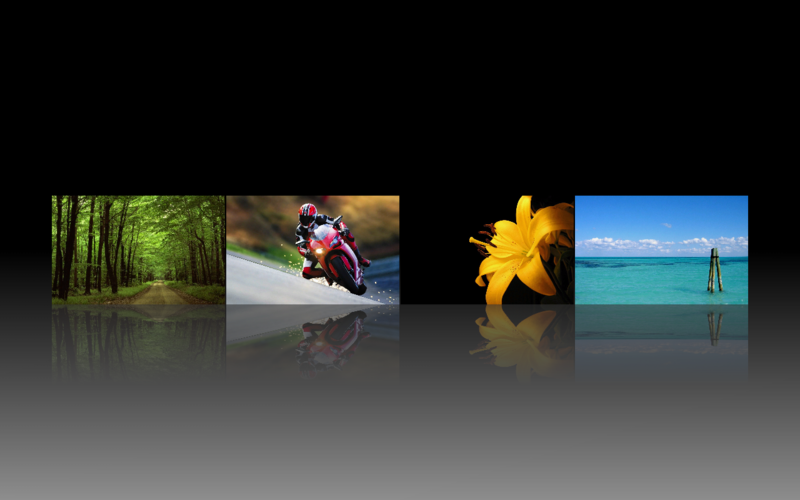 Enjoy different wallpapers on all your workspaces. Did you like it? I would like to see your screenshot with all the workspaces as I have shown here. Or if any other customization you did to achieve better results, drop a comment here so that others also can learn from you. What is Compiz, Beryl, Metacity & Emerald etc. in Ubuntu? 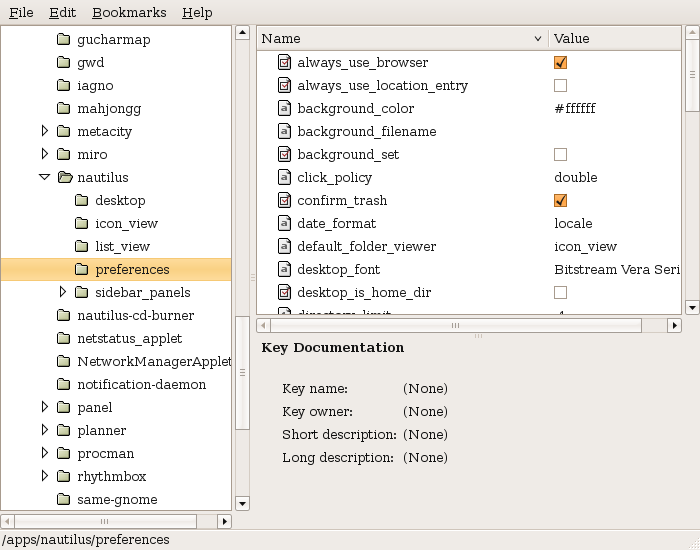 You might have been hearing lots of terms for desktop managers in Ubuntu or any other distro. I was also confused initially but I collected some information which I wanted to share with you. Compiz is a Desktop manager which is enabled by default in Ubuntu 8.04. It controls how all the windows appear on the screen, like the title bar, colors, icons, cursors and borders etc. 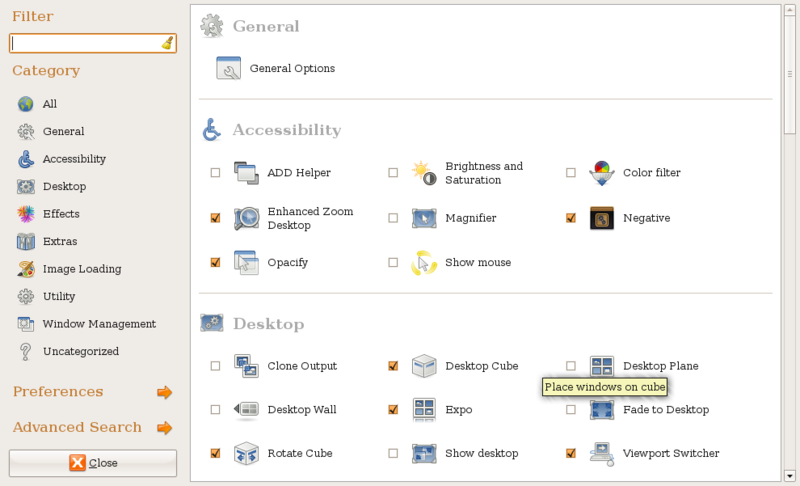 Ubuntu already has one which is called Metacity which is very basic. The advantage of using Compiz is that it has lots of cool effects. Which can make you windows transparent, enable Desktop cube, many customized effects while minimizing, maximizing, opening, closing & moving windows as well as many eye candy effects. Compiz-fusion was originally called Compiz and had some limited effects. Another window manager Beryl had some other effects and some common effects as Compiz. 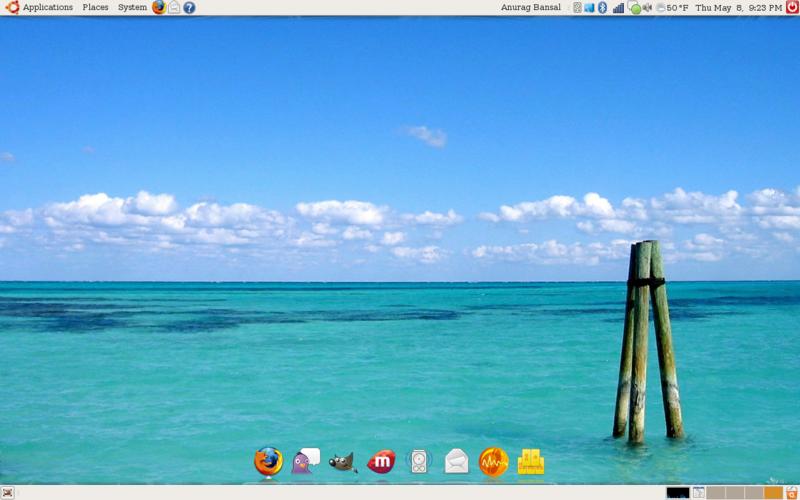 Eventually Compiz and Beryl combined resulting in Compiz-Fusion. Emerald is another desktop manager which helps you modify the settings further and help you cutomize the entire theme itself. But you can enable either one of Compiz or Emerald. This is a short explanation of the terms. There are some other plugins like cairo dock and AWN also which provides you the ability to get a Mac OS X like dock. There are definitely lot of things you can do to get better look than Vista. Ubuntu 8.04 by default has Compiz enabled. Go to System > Preferences > Appearance > Visual Effects and select the last option ‘Extra’. Once installed, play around to get the required effects.